Invitation to the Graduation Ceremony of “BeVisible” (19th May 2017) – trixiewiz e V.
We are happy to invite all interested people, friends, and partner organisations to the graduation ceremony of our one-year pilot project, BeVisible, on the 19th of May at 17:30 at (Rathaus) Pankow Town Hall. After a few introductory speeches, Trixiewiz eV, Sören Benn, the District Mayor of Pankow, and Katarina Niewiedzial, the Commissioner for Integration and event patron, will hand out certificates to the 10 BeVisible participants. We will then hear from the participants themselves about their personal experiences in the programme. Afterwards, everyone is invited to enjoy the rest of the evening and get to know the graduates. 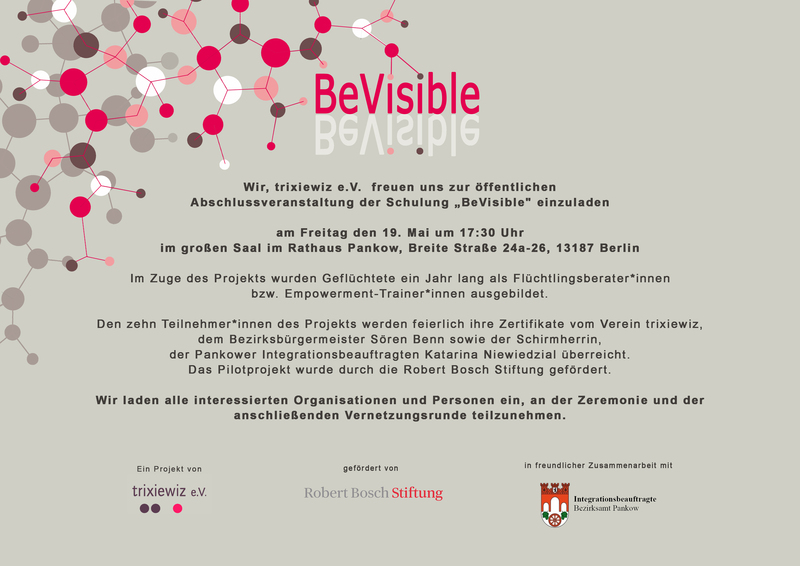 The Trixiewiz team and the graduates of BeVisible are pleased to welcome you all!